Bitcoin runs on a distributed network of computers that participate in securing and maintaining a ledger of transactions called a blockchain. A blockchain is made up of blocks that are secured every 10 minutes by computers called miners. For a detailed explanation of Bitcoin mining, see our guide on the subject. A block explorer is an interface for exploring blocks in a blockchain in a detailed way. Bitcoin Magazine’s explorer, like others, provides updated information regarding every block in Bitcoin’s blockchain. Such information contains details including the total number of transactions in a block, as well as the individual outputs for each transaction. The explorer also includes information about the block itself, such as how many blocks have been made before it (block height), the number of confirmations it has, a timestamp of when the block was accepted by the network, and size of the data inside. How Can I Use a Block Explorer? Block explorers are designed to be relatively user-friendly so that anyone can understand what information is being displayed. Using one is as simple as clicking through the most recent blocks and viewing the data inside it. Block explorers are useful because they are a way for anyone to explore any part of Bitcoin’s blockchain at any given moment without having to manually search for a specific transaction. The search bar in a block explorer allows users to search for various data on the blockchain, including block height, hash, transaction ID and address. Why Is a Block Explorer Important? Bitcoin Magazine’s block explorer is a great example of the value of open-source projects. Blockstream’s release of Esplora shows that useful open-source projects provide value to a community. Block explorers are important to Bitcoin because they serve the function of allowing users to navigate through a complex field of information that is unreadable in its raw form. Similar to web browsers, there are myriad versions of block explorers that all serve the same function with different design interfaces. 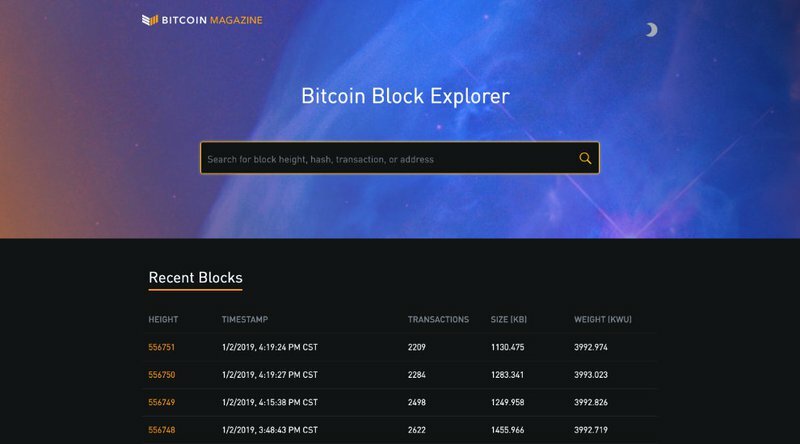 Bitcoin Magazine’s block explorer is one of many new website features rolled out in honor of Bitcoin’s 10 year anniversary. NEXT POST Next post: Who Created Bitcoin?